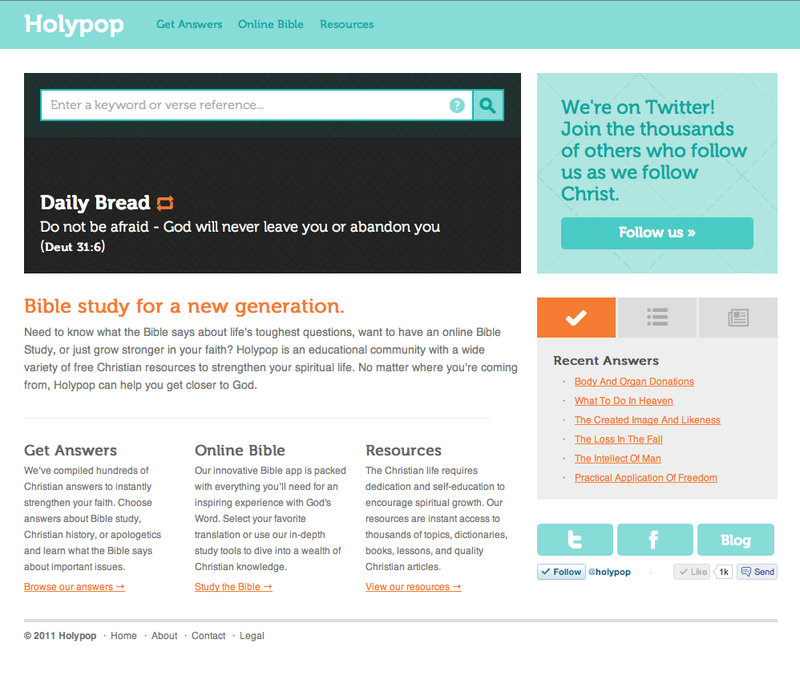 Bible study and Christian answer website, Holypop.com, has completely rebranded their website to reach young believers. This relaunch comes at a time when over 70% of young people brought up in the church are leaving as they enter their mid-twenties. We're living in a can-do culture now. You can learn anything online, from sewing to boxing. Holypop is Do-It-Yourself Christianity. Recent studies show that young Americans, 18-24, raised in Christian homes, are exiting the Church at an all time high. As this has occurred,numerous denominations have embraced liberal theology such as the ordination of gay ministers, acceptance of the theory of evolution and the promotion of universalism as a means of salvation. Christian website, Holypop.com, saw these disheartening statistics and came to a unique conclusion behind the mass exodus. "This all stems from a fundamental lack of biblical literacy in the family, and an unwillingness of the modern church to seriously confront controversial issues," said Chris Carberg, 28, founder of Holypop.com. "Many parents continue to push their religious beliefs without understanding what they believe and why, and modern young people have been trained to smell any hint of hypocrisy. That's why we decided it's time we go straight to the young people." 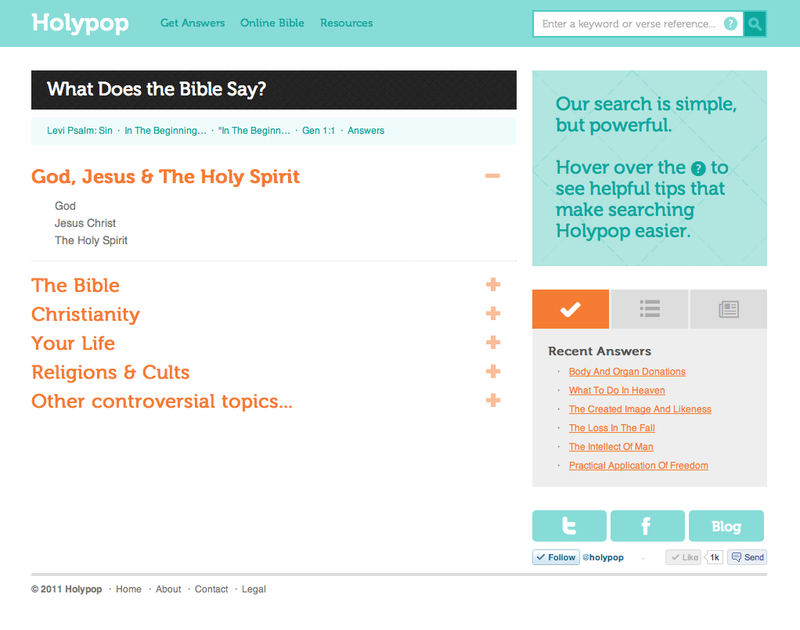 Holypop.com has made it their personal charter to develop strong faith in young people through self-education. This includes redeveloping and redesigning their website from scratch, integrating hundreds of answers to important questions and other new content from Dr. Elmer Towns and Dr. Jerry Falwell, founders of Liberty University. Additionally, Holypop revamped their online Bible with study tools and offering 12 translations, including the Bible in Spanish. This focus is obviously more than a marketing ploy. "We reconfigured every aspect of our website for this cause, and our passion for developing Bible literacy is the entire focus of Holypop.” Carberg said. "This is a full scale assault against what we know is endangering the future of the church, and destroying faith in America and abroad." Holypop co-founder Scott Basham, 55, a college Sunday school teacher at Aloma Church in Winter Park, has seen the affect that sound biblical teaching can have in the lives of young people. He’s now begun integrating Holypop into his lessons and encourages his students to make faith a part of their everyday life. "When people have a daily quiet time, it's been shown to make an impact on their personal relationship with God and the genuine nature of it. 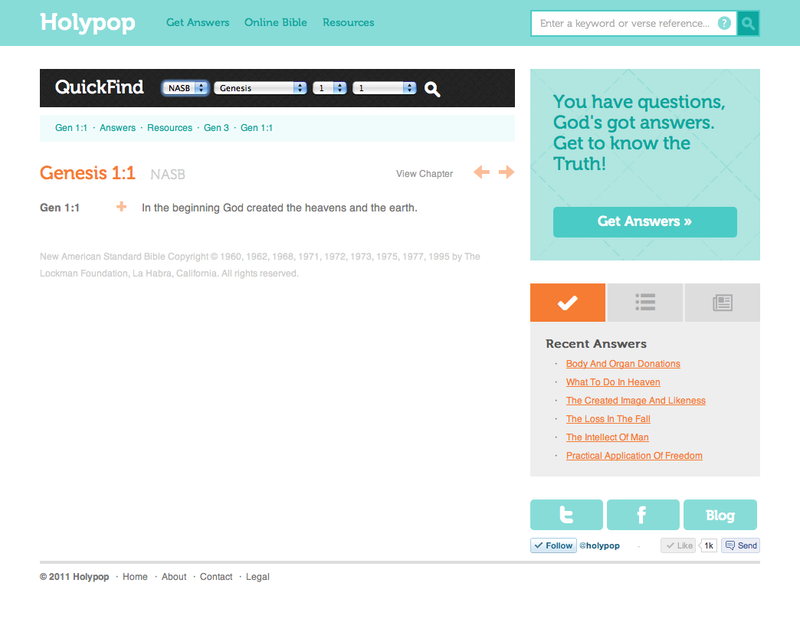 Holypop allows kids to be on Facebook one minute and then jump over to Holypop the next for their daily Bible study. It's easy, and it reinforces why you believe what you believe, rather than dogma," Basham said. The Holypop founder sees this rebranding as something that will truly benefit people in the long run. "Holypop is easy to use, and it contains the most important content of any site on the Internet. This is the first large step of many to bring our young people back to Jesus in a genuine and loving way.". 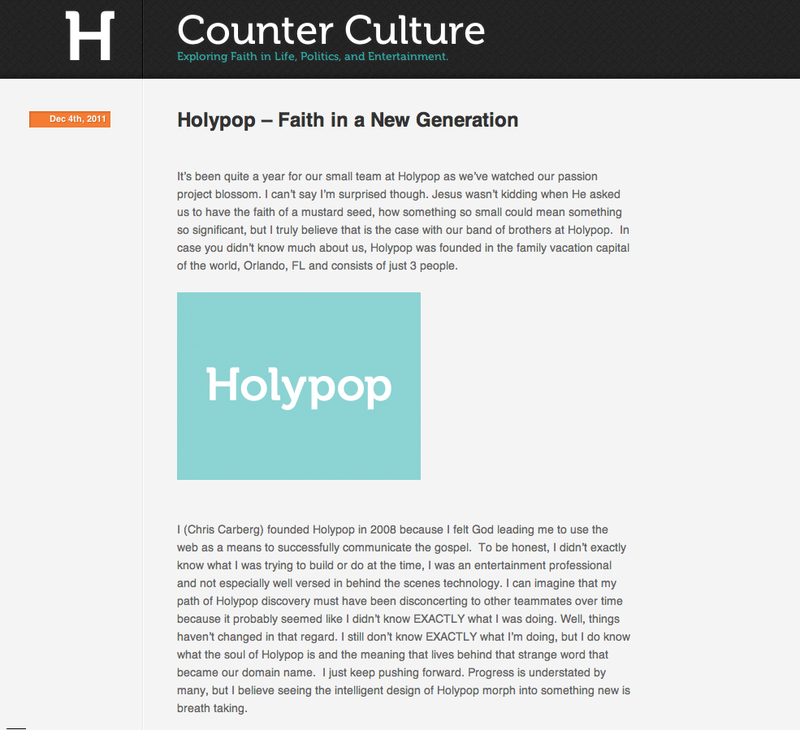 In addition to their new website, Holypop has also launched "Counter Culture", their blog about "Faith in Life, Politics, and Entertainment." Counter Culture focuses on providing relevant commentary on issues that affect modern Christians, taking on controversial topics from Gay Marriage to how faith is affecting Hollywood. Counter Culture is updated regularly and also provides Christian news links. Holypop.com LLC was founded in 2008 in Central Florida, offering a Christian web-based educational community with quality biblical content, absolutely free. Holypop is also is in the process of developing mobile apps, web applications, and solutions for churches.